Have the food cooked and kept warm or cold half an hour before the party. I always thought I want to cook until guests arrive so that it can be hot and ready to go. But now I know to have it done and just kept warm so I am not scurrying around the kitchen while people are arriving. This is a major sanity saver. Keep the decorations nice, elegant and simple. Pick two or three main decoration pieces that you want to showcase. You don’t have to have every inch of the room jazzed up for the party. Save time to make the few decorations stand out and look nice. 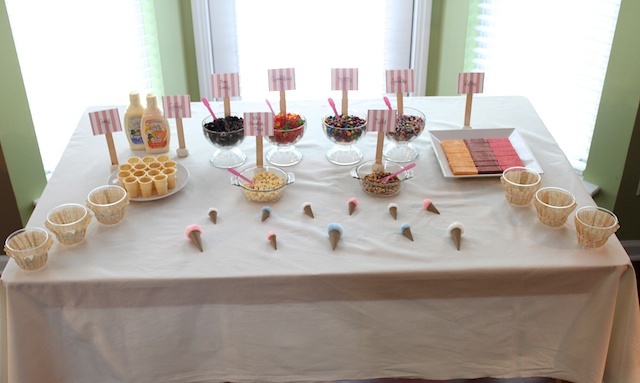 For the ice cream party I just kept with the ice cream banner and the ice cream garland as the main decorations. Spend your money on a nice party favor. I’m not saying spend all your money on the party favor. But if you are going to do party favors, the rule I go by is get one nice thing rather than an accumulation of cheap junk things. I think that the cheap junk things just get tossed away as soon as it gets home. And often times I find I spend less when I get one nice thing. The astronaut ice cream I gave for the ice cream party came out to be $2.50 per person. Whereas I found some ice cream knick-knacks at a party store I thought about using, but to get enough of those to fill up a goody bag would have costed about $5 per person. Go with a theme. That usually helps me come up with ideas for decorations, invitations, food and party favors. It doesn’t always have to be a character theme. It can be simple as polka dots. Then it helps you come up with ideas for everything else… polka dot wall decals, sandwiches cut in circle shapes, melons in ball shape using a melon scooper. Take pictures before the party. Do a mock party if you have to. Have your child stand with the cake. Take pictures of you and your birthday child. Get some good shots of the decorations. Do this all before the party because usually you are so busy hosting and playing mom during the party you forget about the photos. Or you can even assign someone else to be the photographer. Give them a list of shots you want to make sure those are not missed. 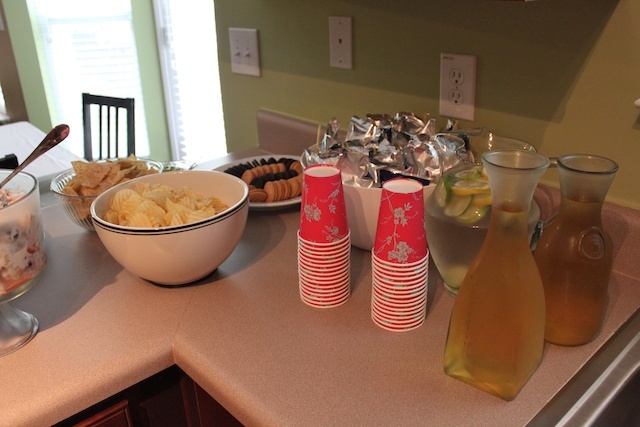 » Tell me… What are your tried and true children’s birthday party tips? These are great tips so you can have your cake and eat it too! Love it- thanks.